I am configuring a G4+Thunder wire-in ECU to run a Nissan 370z with Dual Drive-by-wire Throttles. I need to know if TP(Main), TP(Sub) are configurable across all AN Volt Inputs ie. AN Volt 1-16 ?? Or am i only able to use AN Volt 1-12 ? I am currently trying to use AN Volt 13 &14 for TP 2 (Main) and (Sub) but there's no options for it. Im doing this as i am using an extension/breakout harness and its already been wired to pins D8 & D9. Is this possible at all, or do i have to use a different input? I've just had a look and it looks like you need to use An Volt 1 to 12 for TPS inputs. I'm happy to ask the engineering team to make it possible to use any An volt channel, but I can't say when this would be done by. Ok Thanks for that Scott. Ill just change the pin configuration on the breakout harness for this particular application, and ill remember this for future installations. I've heard back from the engineers about this. The An Volt channels 13 to 16 are slower responding than the lower numbered AN Volt channels, so fast signals like TPS are not allowed. I will see if we can get this info added to the PCLink Help file. 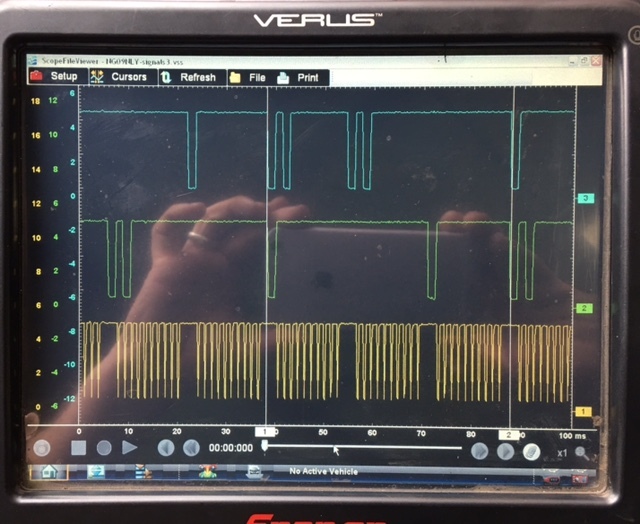 I have now connected all 4 TPS wires to AN Volt channels 1 to 4 and both throttles are now working. There are still some throttle related error messages to work out, but at least both throttles are opening/closing in sync. But I'm also having another issue Scott, where the RPM is quite erratic. Triggers are connected in piggy-back and Trigger Setup used is "VQ35". I have yet to verify the scope pattern but i believe it is the same ie. "10-2, 10-2, 10-2". At idle, the engine speed spikes excessively even with trigger filtering at "4". Is there anything you can suggest Scott? I'll also report back with the crank trigger scope as soon as I can. We have not done a VQ37 ourselves. It sounds like the ECU is seeing trigger errors. As the crank and cam sensors are hall sensors there is not a lot of options you can try. You may need to adjust the Trig 1 and/or rig 2 'Edge' setting. When adjusting this you will need to recheck and likely change the trigger offset slightly. little more to the VHR37 than your seeing as the cam trigger are different to a DE/REV UP motor , the HR and VHR are the same crank trigger but I am sure the cam trigger is different. Do you still have the variable valve lift on the VHR? Yes it still has the VVEL and CVTC. I think you're correct in saying that the issue lies with the cam trigger. I have scoped the crank trigger and both LH & RH inlet cam position sensors and compared it to the VQ35DE. The patterns appear the same but the phasing is slightly shifted. I guess this is what is causing the trigger errors and is possibly due to the VVEL/CVTC. Sorry about the separate screen shots, I wasn't able to display the complete 720deg cycle in one screen. Is there another trigger signal that can be used that wont shift or is there an option for a custom trigger setup? As you mentioned, the phasing looks to be different and also the signals appear to be inverted. This could be a problem on the cams when the ECU is looking for a rising or falling edge. None of our other Nissan trigger modes are even close to the VQ37. I had the thunder ecu for a while but i just started now doing the wiring setup. The VQ35HR and the VQ37VHR share the same phasing. Was there any solution that came up ? or will the VQ35HR / VQ37VHR phasing will be added in the software ? The feedback we have had is that we would need to make a trigger mode specifically for the VQ37. This is on our request list to do. Is the VQ35HR different to the regular VQ35de? as I'm sure we have had an HR motor running in a boat that had been converted to a cable throttle. they probably used a different trigger wheel or exchanged the trigger cam sprocket/gear from the DE. Yes trigger wheel (flywheel) pattern is different and the cam triggers are in a different position on the inlet/exhaust cams. Is it better for you guys to have a car or are you happy to work with Scope readings? I have a HR car as a track car. Okay will get my track car in the workshop and get a scope image. The crank signal should be the same between the HR and VHR motor as the flywheel is the same part and the block is the same part so the crank trigger is in the same position. The main difference between the 2 motors is the top end. 350Z HR has variable inlet/exhaust cam and the 370Z has only variable intake but also variable lift. The intake cam/phase sensors are in a different position between the 2 motors. Generic scope from Nissan workshop manual. There is work in progress, i just submitted this in PM to those who can start the work into implementing the VQ35HR support into the software. The VHR shouldn't be to far off. Simon has had to take off on leave rather unexpectedly. So I will step in as the middleman and try to get this underway. I have just passed it on to engineering tonight for their comments and I will report back tomorrow if they need anything further. I went back into my blown VHR engine box and only the intake camshaft has the trigger wheel which appear to have the same teeth pattern as the HR engine. However the exhaust does not have any (fixed/single gear). I found that in our workshop manuals seems strange they inlet cam scope should be the same as the inlet sensor position is in a different position on both motors. sorry for the phone picture of scope. This scope came from a 370Z that we are having issues with the cam/s scope are offset to the crank. Seems we are having issues with the crank trigger/wiring. I think the phasing is the same between the HR and VHR thou which is good. We already have some data on the VQ37VHR and our engineering team has stated from their initial look that they appear to be the same. One problem we will have with this engine is according to Daniels data the exhaust cam can move 80 degrees, but we are limited (by hardware) to a maximum of 70 degrees. So we are never going to be able to give you more than 70 degrees retard from its home position. I suspect it probably only had that much movement to allow some sort of EGR or emissions strategy so in my mind this shouldnt be a big deal to most performance users. Engineering has just given me a test firmware with VQ35/37HR/VHR Trigger mode. If any of you guys have a something to test it on please PM me. any updates with vq37vhr and VVEL ?